It was, perhaps, an unlikely brace of circumstances: odd that a 19 year old (Mary Shelley) would create one of the two most potent horror figures of our epoch – Frankenstein, and equally odd that a clerk-turned-impresario, Bram Stoker (1847-1912) would the other. Dracula evokes all the lip-smacking pleasures of pure, endogenous evil, and combines myth, misanthropy and eroticism with the false promise of immortality. The Universal film, made about 500 years after the birth of the man who inspired the book (Vlad the Impaler), is the definitive classic version, an eerie, atmospheric, surreal, slimmed-down and by current standards, restrained account of the Count’s trip to London for fresh blood and mayhem. 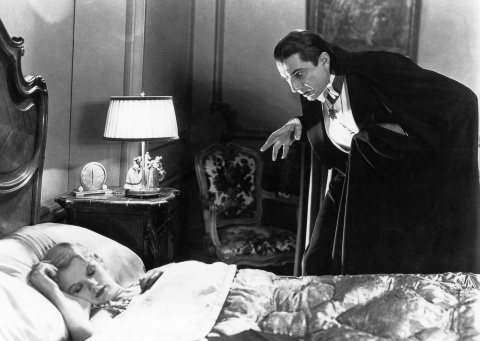 Bela Lugosi is incomparable as Dracula. It is a weird, toe-curling, performance – almost absurdly arch, deliberate and slimy. His act has been brilliantly described: “Dracula’s every movement [is] premeditated as a dancer’s...”* Forget that he wasn’t even Romanian (or Wallachian) – once you see him, eyes burning through the camera lens, you can’t think of anyone else as the Head Vampyre (with due respect to Christopher Lee, Max Schreck, Frank Langella, Gary Oldman, et al). Dwight Frye as the barking Renfield is completely over-the-top, yet watch him in the dark and you feel fear as much as hilarity (of course, both reactions can be linked). Edward Van Sloan as Van Helsing is a stoic and determined hero from another age, yet he is as good as any lycra-clad lump of today. When he sets his will to resist Dracula’s malign bidding at the home of Dr Seward, it is a gripping moment, even if you are familiar with it. The film fascinates for its defects as much as its style. There are big continuity problems – they seem not to matter. Some of the acting could kindly be called comic – it doesn’t seem to matter. Apart from an opening piece from Swan Lake, and a little Wagner at the theatre, there s no sound track (at least, none that exists). The sets show a fair few seams but again, who cares? It all feels great and the poverty of technology plays to advantage. So check this out from your local video store (if one exists near you) or from your legal streaming site. Or look up the book, which is wordy but not over-long, and make your own movie in your mind. *Joyce Carol Oates, “The Vampire’s Secret” from The Movie That Changed My Life, ed. David Rosenberg (1991).